Special Offer: $3 off regular admission, $2 off child admission, $55.95 carload. Grab your coupon now! Click on the coupon to print! 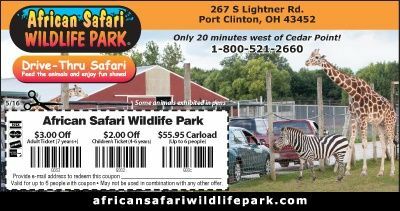 African Safari Wildlife Park is a drive-thru and walk-thru zoo park offering fun for the whole family. The main season for 2016 is from May 27 to September 5.